Francois van Coke is a South African musician and singer best known as the lead singer for the bands Fokofpolisiekar and Van Coke Cartel. He has appeared on numerous television series as a musical contributor or guest, including the e.tv magazine show Musiek Musiek in 2014. He collaborated with the band The Soil on the second episode of Jam Sandwich 5, which aired on SABC3 on 23 April, 2016. Later that year he collaborated with iFani on e.tv's version of the show, Coke Studio, in Season 2, Episode 5 (which aired on 24 September, 2016). Just five days later he was featured as a guest judge on the kykNET reality competition series Varsity Sing (Season 1, Episode 12, which aired on 29 September). 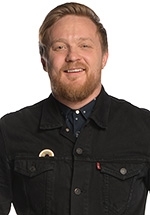 Francois hosted the game show Die Van Coke Show on kykNET, which premiered on Monday 8 October, 2018. The format of the show was created around his passions and interests, so a musical element is part of the show.